The Drycleaner's - Where great clothes go to die. Over the last year or so, I've been focused on learning more about clothing quality and construction and during a recent chat with my tailor, the proverbial light bulb went off. It dawned on me that for all the websites and forums dedicated to enlightening men about "how it's made"or extoling the virtues of Holland and Sherry, Loro Piana and Scabal fabrics, there aren't very many talking about how to actually care for said fabrics in the event (heaven forbid) that you do end up getting a stain on it as sometimes happens in the real world and have to take it to the cleaners. Question then is, "How do I find one that won't actually make this much worse than it already is?" To answer this question, I turned to....you guessed it....the internet. After a bit of looking around, I came across some tips that made sense to me and as one of my goals here is to create what I hope to be a single point of information, here we go. Basically, there are two types of dry cleaning businesses out there. The first type is what's called a "Package Plant", where the dry cleaner actually has their equipment at the location and most of the cleaning is done right there. The second type is usually called a "Dry Store", which you will see typically with franchises. These locations pretty much are nothing but drop off sites that transfer your clothes to a central location where the dry cleaning actually takes place. Now which of these two is the better? In my experience, the "Dry Store" set-up is pretty much a churn and turn deal. They exist to provide a service quickly and inexpensively (read cheaply). Inevitably, the cliche of you get what you pay for plays itselfout. Afterall, if you're paying $10 to get your $1,000 suit dry cleaned, what are you really expecting? Dry cleaning is good for taking out oil-based stains (such as those from lotions, salad dressings, and pizza drippings) but it can potentially set in water-based stains (such as those from juice, coffee, or even perspiration). A good dry cleaner will thus identify the types of stains you have and pre-treat them accordingly, so that damage isn’t set in through the cleaning process itself. Make sure your cleaner has a technician that does this. 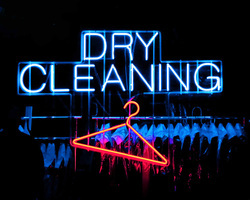 Some dry cleaners also re-use their cleaning fluids, which means dirt from previous loads can be redeposited. Ask your cleaner if they use freshly purified or freshly distilled fluids with every run. If you’re having garments pressed, you may also want to enquire if the job is done by hand or machine (though, from my experience, many places that do a machine press will still say they do it by hand). The problem with a machine press is that they’re often just blowing hot steam through a garment, which can take the shape out of a high-quality suit and ruin the seams on a low-quality jacket. Finally, when you get your garments back, feel the fabrics. Do they feel soft, as you remember them, or a bit stiff? Many cleaners will use what’s known in the trade as sizing, which stiffens a fabric a bit so that it’s easier to press. Great for efficiency, but bad if you want to maintain the soft hand and beautiful nap on a something such as high-quality flannel wool. As always, the more you know.